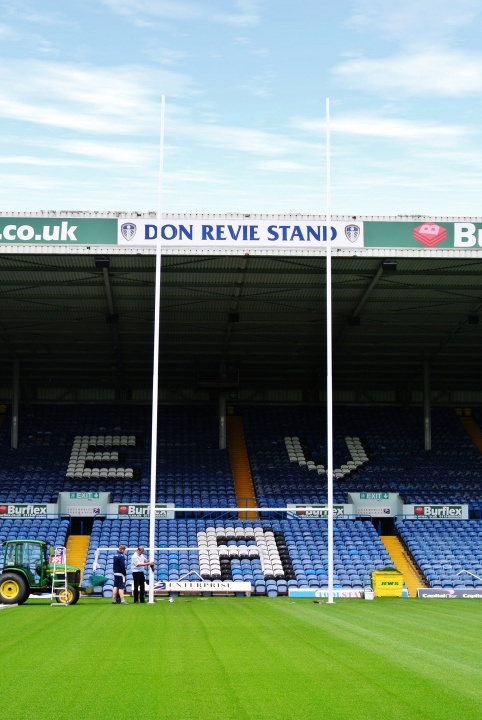 Elland Road transforms itself into a Venue fit to host the Rugby World Cup. 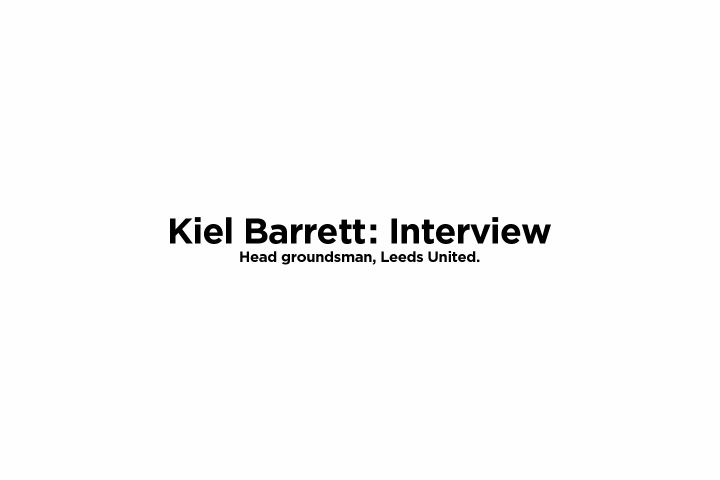 As one of the official Rugby World Cup venues we caught up with head groundsman Kiel Barrett, to discuss how the football stadium -home to Leeds United has prepared for their upcoming Rugby World Cup fixtures. Major ground works were undertaken to extend their grass run off to six metres to meet Rugby World Cup pitch stipulations and install our 17-metre tall Rugby Posts within the 40 tonnes of concrete recommended. It is hoped that the football venue will fill its 37,914 capacity with tons of passionate rugby fans for both matches they plan to host, in anticipation of another world-class event, held in the UK. Harrod: How long have you been a groundsman? Kiel: 10 years, I started my career at Headingley stadium. Harrod: Can you tell us a bit more about your role at Leeds United? Kiel: I'm the head groundsman, and I oversee both the stadium and training ground pitches, along with a team of 4 staff. Harrod: As head groundsman how proud are you that your venue was selected to be a host venue for such a prestigious event? Kiel: Very proud, events like this don't come around very often. It could be a once in a life time opportunity to prepare a pitch for a Rugby World Cup!!! 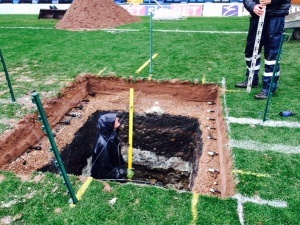 Harrod: Is turning Elland Road into a rugby venue one of the biggest challenges you've faced as Leeds groundsman? Image: Socket installations for the rugby posts. Harrod: What preparations have you made for the installation of the 17 metre tall rugby posts? Kiel: We had a longer than normal renovation period this year. We had to make the pitch playing area 95 metres long, and have an RFU standard 3G surround installed, along with increasing the run off to 4m. We had a local contractor (Chapelow sports turf) come in to dig out the foundations to a depth of 1750mm. Because we weren't 100% sure how deep certain things were under the stadium pitch, we had a company come in (2014) to scan the pitch, to determine how deep the two wells and stream were, and to double check for anything else. 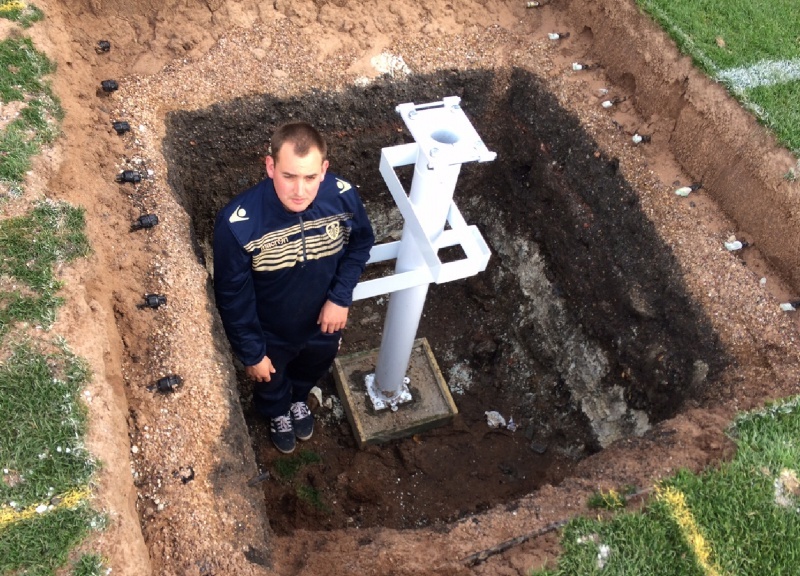 Image: Leeds United head groundsman Kiel Barrett next to the RWC sockets. Harrod: What was your first thought when you heard that 40 tonnes of concrete were needed for the posts, and how did you feel about having this under your football pitch? How have you overcome these? Kiel: What are they putting up?!?!?!? A Skyscraper? We had to cut the under soil heating pipes and re run them over the top of the cement, apart from that we had no real trouble preparing the sockets and is what it is. Harrod: Have you had to adapt your working day to accommodate the ground being ready for the Rugby World Cup? Kiel: The 3 days just before will be very long. Harrod: What are you looking forward to the most about seeing a rugby match being played at Elland Road? Kiel: Just being involved in an international competition. Harrod: Finally, do you have any words of advice for any young aspiring groundsmen? Kiel: Never stop trying. There is always a solution to every problem and don't be scared to ask for help. Have rugby posts of your own that require installation? Not sure how to safely erect or dismantle them? See our safety guide post at https://www.harrod.uk.com/team-talk/How-to-safely-... for full recommendations and product assembly options.